The team at Back2Life Bathrooms Brisbane have delivered another top quality bathroom renovation. Take a look at the project we recently finished in Nundah. Luke says this bathroom in Nundah was a bit tired and lacked functionality. The clients were seeking a fresh new look and increased practicality in a small space but didn’t want to break the bank. By installing a double bowled vanity basin we were able to improve the efficiency of that all-important morning bathroom routine efficiency enabling everyone to get ready faster. Opting for a wall hung vanity unit ensures the floors are easy to clean, reduces the risk of water damage should someone forget to turn the tap off or the kids get a bit too active in the tub. The sleek, mirrored shaving cabinet unit provides accessible storage at a practical height while creating the illusion of more space. Love mirrors for that! On the floor, the clients have gone for a smart tile insert waste which in addition to a much more appealing aesthetic look are more practical than traditional metal wastes since small items like jewellery can’t easily slip through and they’re not so attractive to little fingers. 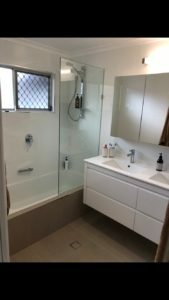 One of the things we love about this bathroom is that with the expert tiling work done by our tiler Frank, we’ve been able to achieve a glamorous look using really affordable tiles from Bunnings. The bathroom floor tiles are a 600 x 300 sandstone and the walls a 600 x 300 white gloss. For for a quote, please visit our website.